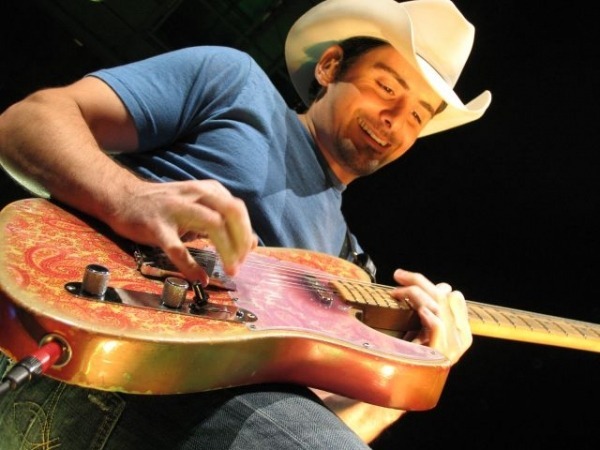 With my review of Brad Paisley’s concert Feb. 11 at the Tacoma Dome, I begin writing occasional music reviews and features for the Seattle Times. Paisley’s “Virtual Reality” tour features sets by The Band Perry and American Idol winner Scotty McCreery. Paisley, a West Virginia native, offered a dazzling show packed with nearly two dozen of his hit songs, as well as eye-popping special effects (including a duet of “Remind Me” with Carrie Underwood in holographic form). The country star blended romance, comedy, nostalgia and social commentary in his more than two-hour show. He also demonstrated what an amazing guitarist he is. Andy Griffith of Mayberry fame appeared in the video accompanying “Waitin’ On a Woman,” a song inspired by Paisley’s upbringing in Wheeling, W.V. “Old Alabama” featured a video starring members of country group Alabama. The surf rock-inspired “Working on a Tan” included clips from an old Annette Funicello-Frankie Avalon movie. And “Welcome to the Future” demonstrated Paisley’s keen grasp of history and social change, as well as his respect for American values. My review was also posted on Paisley’s website. Read it here. In the coming days, GeneStout.com will appear on the Seattle Times website, but no longer at Seattlepi.com. Readers can still go to Seattlepi.com to search for my stories going back to 1986.